Red pandas can reach a size of 42 inches long, including a long, bushy tail. They weigh between 7 and 14 pounds and have a lifespan of about 8 years in the wild and up to 15 years in zoos. Remote mountainous areas of dense forest and bamboo thickets. High-altitude (3,000 to 12,000 feet) mountain forests and bamboo thickets in south central Asia, from the Himalayas to southern China. Bamboo leaves and fresh shoots, as well as berries, blossoms, bird eggs, and small plant leaves. 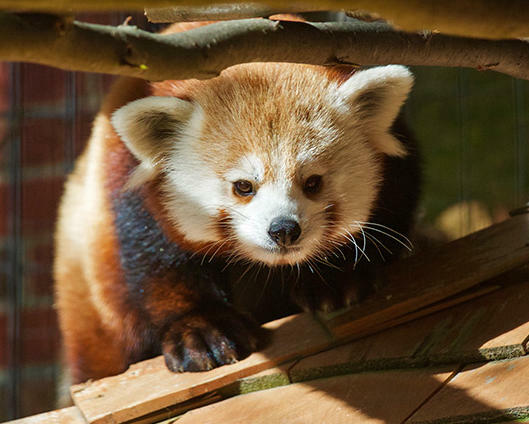 ​Red pandas have a taste for bamboo, but unlike their larger relatives, they eat many other foods as well: fruit, acorns, roots, and eggs. Similar to giant pandas, they have a modified wrist bone that acts as a sixth digit or thumb. While the red panda’s scientific names means ‘fire-coloured cat,’ they actually have more in common with bears and raccoons. Their soft, dense fur covers their entire body, including the soles of their feet. They use their long, bushy tails to balance when they’re in trees – and also to cover themselves in winter. This mild-mannered animal can defend its territory by standing on its hind legs and using its sharp claws to strike out if threatened. The red panda can also release a strong odor from scent glands at the base of the tail that may make a predator think twice about a red panda meal.